The wind outside is howling the same as it was the night I decided to paint this place. The power of the elements here lean to the extremes – fierce winds drive wildfires, water is feast or famine and the earth is blood red… Oklahoma’s red earth has become an obsession for me. I step on it, touch it at every opportunity. Red Rock Canyon is a sanctuary, giving the illusion of protection from the extremes. This spot lies across from the reservoir, a dark pool at sunset, deep in the shadow of canyon walls. 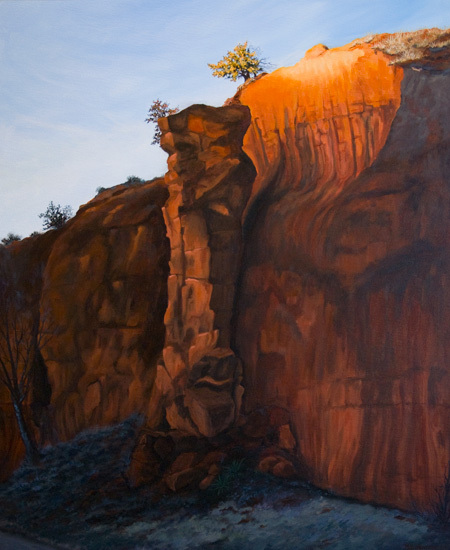 Only the tip of the cliff still catches the sun, before blue shadows dull the red stone and darkness covers the canyon floor. Absolutely stunning…I can see how this would have been such a compelling subject. It must be amazing viewed in person. Thanks, Ingrid! It is an amazing place….